Gimme your Easter basket goodies—or else. 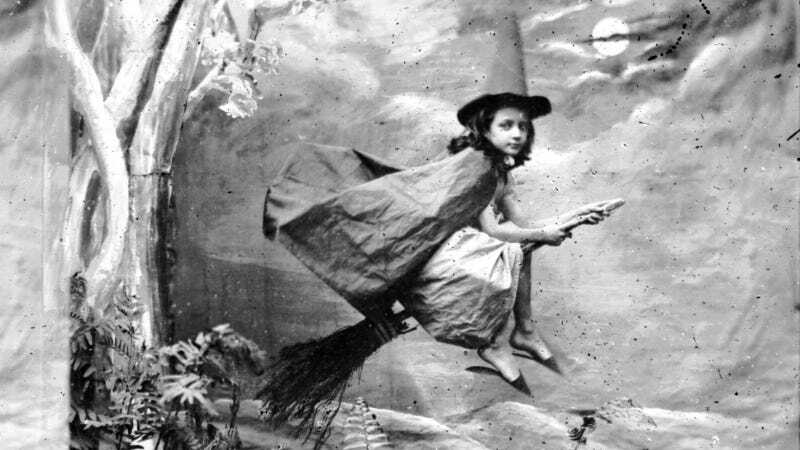 circa 1865: A young girl dressed as a witch suspended mid-air on a broomstick. London Stereoscopic Company Comic Series - 318. Photo via Getty Images. See any witches zipping around last night? If so, that’s because it was Maundy Thursday, and apparently Swedish Easter traditions bear more than a passing resemblance to American Halloween. When lithography printers like Axel Eliassons in Stockholm began publishing holiday cards in the late 19th century, the Easter Witch—usually a happy elderly hag dressed like a Swedish farm wife in aprons and headscarves—became a standard character on often-comedic “Glad Påsk” (or “Happy Easter”) postcards. The printers also made smaller cards for the children to deliver. The tradition apparently continues; here, watch this video, which is completely inexplicable to audiences that do not speak Swedish!